The Lucky Charm given here is to be done on a Bhojpatra and written with a liquid mixture of Gorochan, Ashtagandha and Kesar [Saffron]. This Charm is to be made under the period of Swati Nakshatra [Arcturus]. Write your name in the place in the middle where name is written. This done the Charm has to be worshipped during Laxmi Pujan in the festival of Diwali. Then it has to be worn an amulet on the left hand. 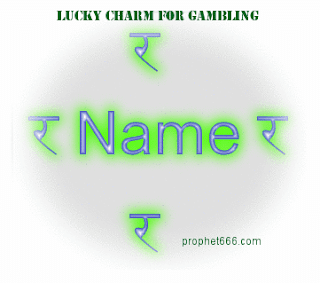 This is said to ensure success in gambling and all games of chance. How if Bhojpatra not available in my country? Can it be written on something else? is wait till diwali necessary?????? Can you give me website to order all materials used to make the Charms on your website such as: Saffron, etc?